Upper Truckee at the S.Lake Tahoe Airport. 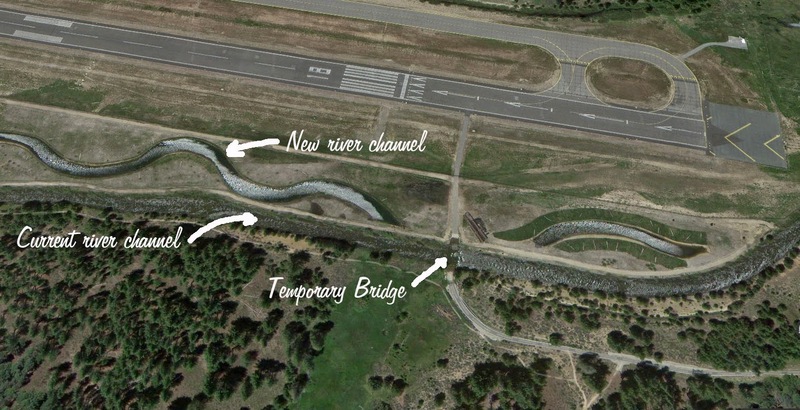 The U.S. Forest Service is repairing the Upper Truckee River channel near the Tahoe Airport. The river channel repair includes the installation of a low temporary bridge over the river. The low bridge will require boaters to carry their boats around the bridge through June 13. The temporary bridge is 5,000 feet downstream from the intersection of Hwy. 50 and Elks Club Drive. There will be signage in the area to alert boaters of the obstacle. The Elks Club Lodge property is a popular launch point for rafters. You can still raft this stretch of the river, but you should bring your walking shoes for walking around the bridge. All areas within the construction zone are “closed” for safety reasons unless you are on the river or walking your boat around the low bridge. The new river channel will provide a better aquatic habitat and support a healthier meadow ecosystem. The new ecosystem will also reduce the amount of fine sediment that reaches Lake Tahoe.